If you are looking for ways to learn about some of the products sold by The Harbour Chandler Ltd. and how they can be used effectively, we have put together a list of helpful videos that can get you started. You can review these tutorials, and if you have any more questions, feel free to contact one of our experts. Watch the demonstration of our Harbour Chandler halibut anchor system. Watch Dane Christensen from The Harbour Chandler explain the Power Paddle and why it is such an effective choice for Ling Cod and Halibut fishing. How to repair deep cracks in fiberglass boats! The Harbour Chandler Ltd. has listed a few links to helpful websites for your convenience. On these websites, you can find services such as in-water inspections and towing, and you can also find fishing-related products. If you are searching for particular marine products and related services, please feel free to give us a call or send us an email, we would love to assist you. Did you know that the grayling is called the ‘Lady of the Stream’? With those distinct markings on the dorsal fin and a blush of golds, blues and pinks on their heads, it’s no wonder why grayling fish were coined this term. The grayling is a species of freshwater fish that are a particularly popular option for fly fishing during the autumn and winter period, when grayling are at their peak. Grayling fishing really does come into its own and if you know what you’re looking for and where to look for it, you’ll be able to start enjoying the grayling season sooner rather than later. Whether you’re a regular fisher and missing your trout fishing or you haven’t tried fishing for grayling before, we’ve got the perfect infographic to guide you through the grayling fishing season and everything you need to know. Grayling fishing is the perfect way to extend your fly fishing beyond the trout season! The grayling spawning season begins and ends in spring while the trout’s season begins in late autumn and ends in early winter. Both these factors make grayling extremely popular for fly fishing during autumn and winter. Similar to trout fishing but coming into its own, fishing for grayling is most successful when you opt for fishing spots with gravel bottoms, in the seam of two currents, in the foam line and just off and around weed beds. The fishing of grayling is officially forbidden from the 15th of March to the 15th of June. This is because grayling spawn during the spring season and it’s a big no-no to disturb them during this time! It’s better you avoid this time and wait for the coming seasons for an easier catch! Grayling mostly feed on shrimps, nymphs and caddis larvae. Longer lighter rods are the norm when fishing for grayling but beware as they can put in a strong fight when caught! They also tend to corkscrew when hooked as well. The longer lighter rods give you the ability to control the line better and are more comfortable to use during your fly fishing season. When playing a grayling, keep the rod tip low as this keeps the grayling fish deep (where they’re happy). Play the fish until it’s upstream of you, then as the river brings the fish towards you, raise it in the water column and direct it into the net. Once a grayling fish is near the surface, it will start to thrash about. This is where most fish are lost and where you will need to be careful. The infographic below, designed by Barbless Flies, outlines the best times of year for grayling fishing, where to find them, which flies to use and the leader setup, as well as some top tips. So what are you waiting for? Get your gear out and go fishing! Worms – Worms are the quintessential fish bait, and they work very well for most species you’re likely to target with your kids including panfish and catfish, as well as more ambitious quarry, such as bass and trout. Worms are available at virtually every bait store in the world, but you can also go digging for them yourself. In fact, your kids may find this part of the outing more fun than actually fishing. Bread – In some places, particularly those with dense populations of bluegill, catfish or carp, you can often catch fish with nothing more than a bit of bread. Squish the bread up into a small ball and just stick it on the hook as though it were a cricket or worm. Bread doesn’t last very long in the water, but because it isn’t “gross,” many kids will enjoy learning to bait their own hook with bread when necessary. Always be sure to investigate the rules and regulations in effect before heading out to the fishing hole. Most municipalities and jurisdictions allow youngsters under an established age to fish without obtaining a license of any kind, but the age at which this occurs varies. You don’t want to end up on the wrong side of the law on your child’s very first fishing trip, so make sure you find out the relevant laws and follow them to the letter. When you introduce your children to fishing, it is important to consider the totality of the event. This not only means catching fish, staying safe and having fun, but it also means understanding the importance of conservation and empathy. For example, while it is perfectly acceptable to catch some fish for the dinner table every once in a while, recreational anglers should practice catch-and-release fishing. 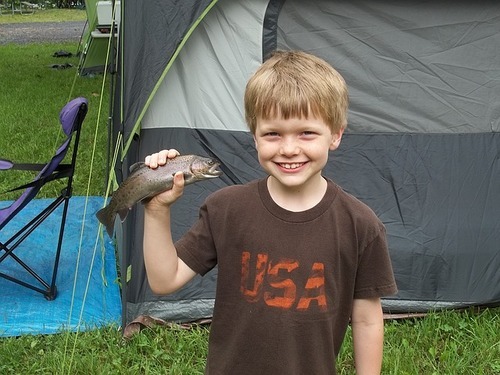 Above all else, make sure that your child’s first fishing experience is fun. You’ll need to remain patient and flexible to do so, but the rewards will justify your efforts. After all, fishing is fun – you just need to show them that it is. Don’t worry if your 6-year-old is more interested in feeding the ducks than catching fish. She’s still hanging out with mom or dad by the lake, which is still a valuable experience. Don’t be afraid to allow your youngsters a bit of a break every so often. They may have an hour of fishing in them, but they may not be able to harness this whole hour at one time. You may be surprised how a 15-minute-break spent chasing their siblings or looking at birds through binoculars will recharge their interest in fishing. Also, remember that comfort goes a long way with children. Make sure to dress them appropriately for the weather, and bring along all the necessary sun screen and bug spray you need to keep them happy. Want the very best insider fishing info?